Welcome to the best of both worlds - our 3 unit townhouse named Mi Casa and historic St. Augustine. Quiet and secluded yet a spectacular location. We are directly on the ocean and the mouth of the Matanzas River Inlet which supplies the Intercoastal waterway. The variation of low and high tides provides a magical quality to Mi Casa that is unique. When the tide is high, surf fish the Inlet just steps from your deck and private alcove. When the tide goes out, it reveals a marine wonderland (we are on the National Registry of places to see) of sandbars and tidal pools...perfect for shell hunters, bird watchers and nature lovers in general. Low-tide also allows the young ones to splash around over a wide stretch of the beach without the normal concerns of a rushing tide. For the surfing enthusiast, a few hundred yards to the south provides the best wave riding for miles around. And,no cars are allowed on this beach. You'll be transported to the 1600's when you visit St. Augustines' cobblestone streets, horse drawn carriges, famous restaurants, and some of our nations original buildings. History abounds. 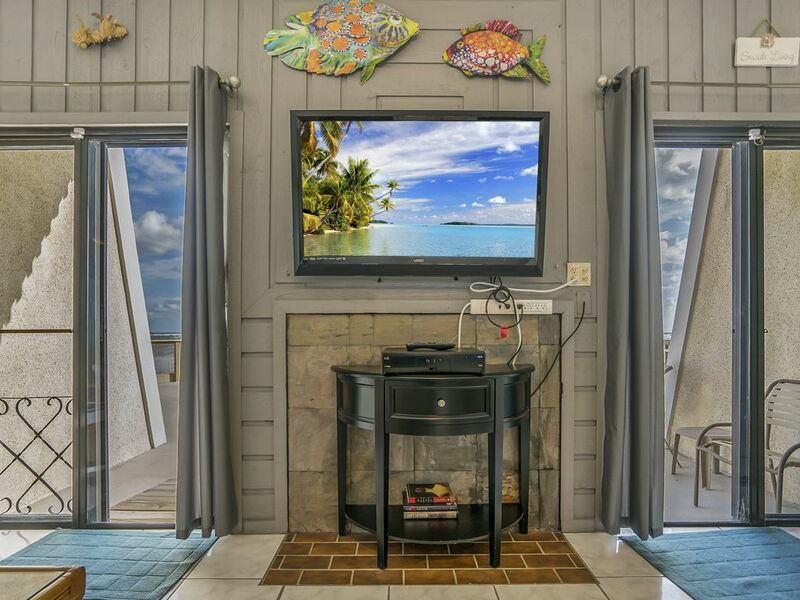 Please check our reviews - if you want the ambiance of the ocean just a sliding glass door away, we are it. The beach as your oyster, that is Mi Casa- we are right on the beach. The world famous Marineland where you can swim with the dolphins or go on a kayak tour is 3 miles south. Five minutes away is Devil's Elbow marina, which has boat rentals to cruise the intercoastal where schools of dolphins abound. The 2000 square foot deck is shared by the three units in this triplex; each unit has a private alcove with separate picnic bench as well as a private balcony directly off the master bedroom - if you are not a romantic when you come, you will be when you leave. Each unit consists of three levels. The sleeping arrangements are: loft - twin beds; master bedroom (with private balcony overlooking the ocean) - king size bed. The master bedroom is twice the size of normal beachfront accomodations, with a large walk-in closet and pure oceanfront view right from your sheets! Downstairs, living room converts to a bedroom with two double beds (trundle bed type). There's two full baths with a conventional staircase. Mi Casa has been under new ownership and operation since May 2011. The middle unit was acquired October 2011 and has been updated with all new appliances, AC, TVs, beds, EVERYTHING!! We're retired business owners and native Floridians. Hobbies include parrot breeding. We're animal people with horses, cows, peacocks, guineas, chickens, and a resident deer born in a paddock 2012 and never left; best friends with a rescue pony in the same paddock, and of course lots of dogs and cats. All concentrated on 55 acres in the middle of nowhere two miles down a dirt road. St Augustine has been our favorite town for 50+ years. We still haven't seen it all. We live 1 hour away, so we can manage the rentals ourselves & check after each cleaning to ensure it meets our standards. 'Clean' is job # 1 in our book! We love the quiet & solitude. The psyche repair is priceless! 10 years ago we visited St Augustines public beach and were not impressed by the crowded beach and traffic. 2011 was the first time we returned, and we bought Mi Casa. Our place at the end of Crescent Beach is on Summer Haven Island and is the closest thing to a private beach you'll find for under $10 million. As soon as we stood on the deck, which really is on the beach, we told the realtor 'we'll take it!' Some of the yearly renters have come back 10 years in a row, and everyone has written glowing reviews of the location, and now all the updates & upgrades that have been made. Sept '12 we shopped for another investment oceanfront condo and were amazed at the $4-500k condos that couldn't offer what Mi Casa already has. We weren't physically able to walk the distance out the walkway to the waters edge. Mi Casa has us spoiled. Walking down our 6' steps (less at high tide) is an unfair comparison. The rod holders on the deck railing are your first clue that nobody else is this close to the water! You don't need to pack everything for a day on the beach, just walk back inside for whatever you need. We let our (leashed) dogs run on the beach while enjoying coffee early mornings. There's rarely anyone else on the beach, unless it's another dog-walker. We put our chairs at the waters edge & keep out toes wet. No hustle-bustle, crowds, traffic or noise. Just nature and its soothing effect. "Salt water is good for the soul"
Luxurious shower upstairs in the completely stonework shower with doorless shower. Overhead rain shower head is fun. Just head north on A1A & you'll drive right into historic downtown. St Augustine loves tourists, and offers many activities and dining. Flagler College frequently offers live theatre. About 20 miles north in World Golf Village there's a giant screen IMax theatre, as well as a golf museum and several courses to play. Look north and see the unspoiled shore line of Matanzas National Park, where the best shelling is found. Look south and see Marineland 3miles south. You can walk all the way to Daytona on the beach. The deck is actually built over the beach. No other property has this feature like ours. Our slogan "ocean spray in your face" tells it like it is, well, when it's high tide and a bit windy. April 26, 2012 guest reported seeing the sailing ship HMS Bounty passing by @ 6:15 AM What a sight to see while lying in bed! It sank not long after that. We took out the phone...everyone has a cell now days. Central heat and air with all new duct work 12/'16. UV light inside the air flow reduces allergens and helps sanitize. The heat pump works really well. You will not be cold at Mi Casa!! all sheets, pillow cases, towels, wash clothes and hand towels provided. Do bring your own beach towels. Stackable full size washer/dryer in the kitchen. Detergent is provided. Bath towels provided. We don't provide beach towels. Comfortable seating with a great view out the two double sliding glass doors. Late model and in excellent condition. We provide the dishwashing liquid. Late model with a bottom freezer. We really like this one! The oven has the hidden heating element, which means it takes longer to reach cooking temperature. We provide aluminum trays on the bottom to make cleaning a snap. A small high table & 4 high chairs. Also a stone covered dining counter with bar stools. No. Too confusing and now it's just too old fashioned. Our giant concrete deck is the crown jewel of Mi Casa- nearly 3500 square feet, directly over the beach, comfortable outdoor chairs and chaise lounges; + a sliding gate for children and pets. Private Balcony, Large Deck, Historic Matanzas National Park walking distance over the bridge. Visit the original fort for free and walk the great nature trail. Waterfront restaurant across the street allows pets in the outside dining area. Several nights there is live music. Historic downtown St Augustine can fill your whole day just walking and looking in the shop windows & enjoying great restaurant food.